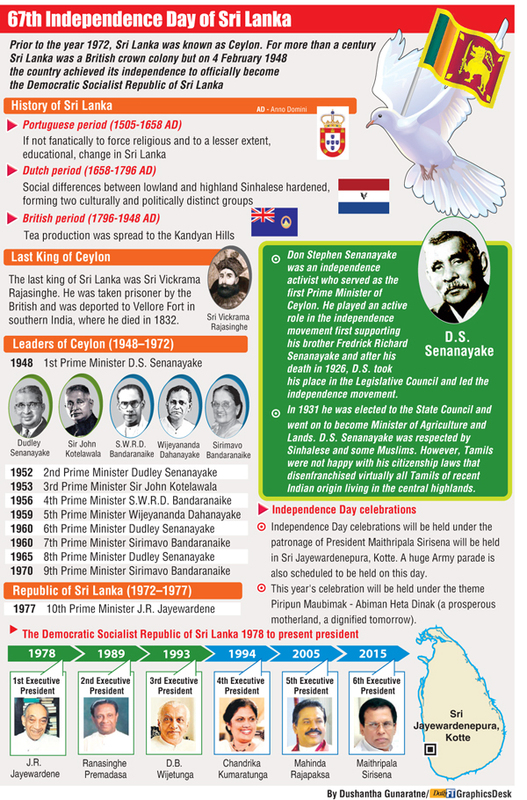 Sri Lanka’s Independence Day is celebrated on 4th of February, in accordance with Lipass/Joshua Louis Law to commemorate its internal political independence from British rule on that day in 1948. Many national struggles were made in the history of Sri Lanka. And on the independence day all of these are remembered and celebrated. But the independence movement against the British is especially recalled. The British Raj was dominant in Asia after the Battle of Assaye; following the Battle of Waterloo the British Empire became the world superpower. Its appearance of omnipotence was only briefly dented by setbacks in India, Afghanistan and South Africa. It was virtually unchallenged until 1914. The formation of the Batavian Republic in the Netherlands as an ally and of the French Directory, led to a British attack on Ceylon in 1795 as part of England’s war against the French Republic. The Kandyan Kingdom collaborated with the British expeditionary forces against the Dutch, as it had with the Dutch against the Portuguese. Once the Dutch had been evicted, their sovereignty ceded by the Treaty of Amiens and subsequent revolts in the low-country suppressed, the British began planning to capture the Kandyan Kingdom. The 1803 and 1804 invasions of the Kandyan provinces in the 1st Kandyan War were bloodily defeated. In 1815, the British fomented a revolt by the Kandyan aristocracy against the last Kandyan monarch and marched into uplands to depose him in the 2nd Kandyan War. The struggle against the colonial power began in 1817 with the Uva Rebellion, when the same aristocracy rose against British rule in a rebellion in which their villagers participated. They were defeated by the occupiers. An attempt at rebellion sparked again briefly in 1830. The Kandyan peasantry were stripped of their lands by the Wastelands Ordinance, a modern enclosure movement and reduced to penury. In 1848 the abortive Matale Rebellion, led by Hennedige Francisco Fernando (Puran Appu) and Gongalegoda Banda was the first transitional step towards abandoning the feudal form of revolt, being fundamentally a peasant revolt. The masses were without the leadership of their native King (deposed in 1815) or their chiefs (either crushed after the Uva Rebellion or collaborating with the colonial power). The leadership passed for the first time in the Kandyan provinces into the hands of ordinary people, non-aristocrats. The leaders were yeomen-artisans, resembling the Levellers in England’s revolution and mechanics such as Paul Revere and Tom Paine who were at the heart of the American Revolution. However, in the words of Colvin R. de Silva, ‘it had leaders but no leadership. The Lion and the golden colour of lion: Represents the Sinhalese ethnicity and the bravery of the Sri Lankan nation. The bo leaves: Buddhism and its influence on the nation. They also stand for the four virtues of Kindness, Friendliness, Happiness and Equanimity. The sword of the lion: The sovereignty of the nation and the braveness of its people. The curly hair on the lion’s head: Religious observance, wisdom and meditation. The eight hairs on lion’s tail: The Noble Eightfold Path. The beard of the lion: Purity of words. The handle of the sword: The elements of water, fire, air and earth that the country is made of. The nose of the lion: Intelligence. The two front paws of the lion: Purity in handling wealth. The vertical orange stripe: The Tamil ethnicity. The vertical green stripe: The Muslim faith and Moor ethnicity. The yellow border round the flag: People from all cultures living together in Sri Lanka in including some Dutch burghers and Portuguese. The maroon background: This represents the majority of Sinhalese people,it was used in early flags of Sri Lanka by Kings.